This may just be the perfect breakfast bread. It's a tweaked version of Dorie Greenspan's (Baking: From My Home to Yours) dense, fruit studded mango bread. It's so good that it may even surpass my beloved Banana Bread with Toasted Coconut and Almonds. And that's saying something. I first made it last winter when we had relatives visiting. It was polished off in two days, and there were only four of us. I have made it several times since, and it has consistently received stellar reviews. It's on my "go-to list" of recipes and will surely be on yours too once you try it. 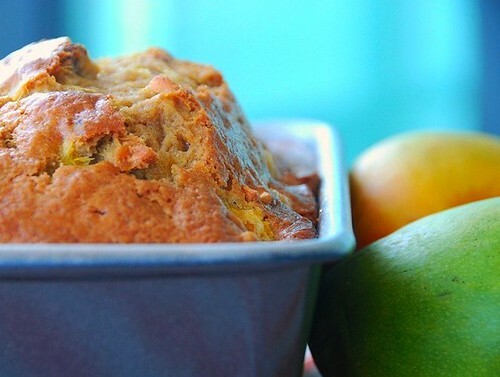 What makes this mango bread so delicious? Creamy mango, chewy raisins, aromatic ginger, and crunchy cashews to start. It's a satisfyingly moist, highly textured, aromatic bread with just the right sweetness. The only hard part is stirring the batter which is stunningly thick. You think to yourself, this will never cook, but it does, perfectly, every time. This mango bread tastes even better after it sits a day or two. So eat it plain, toast it with butter, or top it with tangy apricot marmalade. Any way you slice it, it's delightful. Center a rack in the oven and preheat to 350 degrees F. Spray an 8 1/2- x- 4 1/2- inch loaf pan with cooking spray. Place the pan on two regular baking sheets stacked one on top of the other to prevent the bottom of the bread from over baking. In a small bowl, whisk together the eggs and oil. In a large bowl, whisk together the flour, sugars, baking powder, baking soda, cinnamon, nutmeg, and salt. Pour the wet ingredients over the dry, and using a spatula, mix until well blended. The dough will be very thick, but as Dorie says, "persevere, it will come together." Stir in the ginger, mango, raisins, cashews, and lime zest. Scrape the batter into the pan, and smooth the top with a rubber spatula. Bake the bread for 1 hour 15 min. to 1 hour 30 min., or until the top is golden brown and a cake tester or thin knife inserted into the center comes out clean. (If the bread is getting too brown on top, cover it loosely with a tinfoil tent). Transfer the pan to a rack and cool for 5 minutes before running a knife around the sides of the pan and unmolding. Invert and cool to room temperature right side up on the rack. Check out more mango bread recipes from Chris and Sweet Mary. Oh yes Susan...i think it's time to move on from the banana. Can't wait for the mango season to descend upon us. I like the way this is studded with raisins, & ginger & cashews. YUM!! Oh and the mangoes were gorgeous in the store last week! This would be amazing. Thanks! ohh! fresh mangoes in bread?! i'm in heaven! Oh, man, I wish I had mangoes around right now. This sounds so fabulous. I love fruit breads, and the combination of flavors in your bread sound fabulous. Can't wait to try this out! Mmmmm... Cannot think of anything better. I am bookmarking this. Can't wait for the mango season.. ginger & mango is all I can think of now!! Oh that sounds wicked good! This bread is everything I dream of! A delightful flavor combo! That beautiful bread looks mighty delicious! mango bread has definitely taken over the banana bread for me - shame mangoes are not available all year round though! love the cashews in this! Wow what a beautiful and delicious bread. I just got the book last week and i am in love with it, i have been eading the book every evening and my hubby thinks i am crazy to be reading a baking book like this. I like the cashews in this. What a unique kind of bread! I have never thought of mango in bread but this looks delicious. And the combination of ginger and cashews has convinced me. Am bookmarking this, Susan and like deeba said, I'm waiting for the mango season to kick in! Oooh....I already love it! My son has a Jr. Olympic swim meet this weekend & this will be the perfect, healthy snack for him. I can't wait to impress my family with this one. This looks so good. I have made mango bread before and use the frozen bags of mango from Trader Joe's. This looks so delicious! I will have to try this. I love Mangos and it is a nice change from Banana Bread. Oh I think I'm moving over to mango bread too Susan - this looks so delicious! There's no way this can be good. The mango keeps it sweet and moist. Mmmmm sounds fab! oh what a nice view!! this bread looks so nice . It must be delicious. Nice variation to banana bread ;) yummy! This bread sounds soooo good! The combination of flavors sounds amazing.I'm putting this on my "to make list"! That looks amazing! Does it make a difference baking in tin/aluminum versus glass? Oh now that does look good. As a mango-loving household, I'll need to put this on the shortlist for breakfast soon. karen-You're going to love it! michelle-They have been great here too. elyse-Hope you find some soon then. soma-The fresh ginger is so lovely. meeta-The cashews are a delicious alternative to more common almonds. happycook-It's such a wonderful book. You're going to love it. cwannabe-They are a nice change from almonds or walnuts. val-It does make it naturally sweet. lisa-I've never baked with frozen mango before. That's an idea. janet-Yeah, sometimes you just need a little change. lynda-I'm telling you, it really has been added to my "go to" list. f350-I have never made it in glass, but I have made it successfully in ceramic. So I couldn't tell you from experience. mike-What's not to love about mangoes, right? anali-Put it on the list! That looks absolutely delicious. 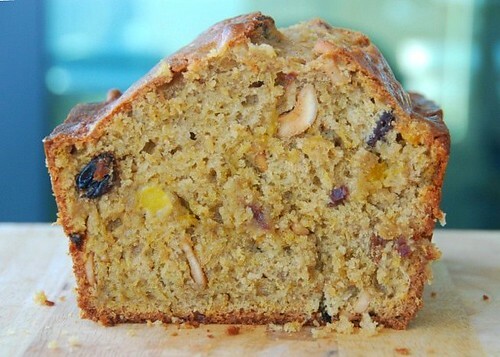 I love banana bread and now will try this mango bread. Thanks! I like the concept of mango bread. 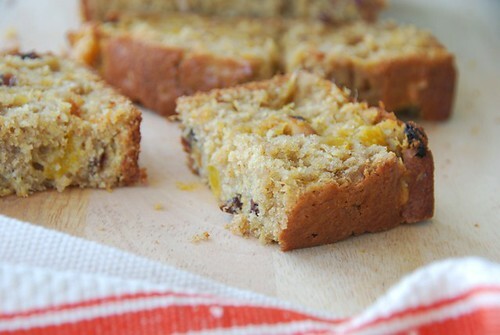 Would you ever use pureed mangoes instead of mango chunks like most banana bread recipes use mashed bananas? To thick to bake . . . you would think it doesn't work but somehow it does. Great recipe. girlfriend say no more! i'm soooold on this one. what?! mangoes and cashews?!?! yes, banana bread, echate pa'lla! Would you be able to say what variety of mango you used? I'm only asking because we get different varieties here and some will definitely not be able to withstand baking, in term of imparting their flavour. I mean like basil, long cooking it loses it's flavour. This sounds so yummy. I love mangos, I'll have to try this one! Wow - too good! I would have never thought of cashews, raisins and mango together, but now that you mention it I'm really excited to try it out. Interesting! I'm going to have to think about this one! Delicious!!! I didn't think Dorie recipe could get better...but you proved me soooo wrong. That looks so great! I love mango! Mango is my favorite fruit of all. I surely will eat mango first time if I arrive to Indonesia in May hehehe... the bread looks nutty and it must be fantastic with mango flavour. Oh Susan, I think this is a perfect combination together, can't wait to try it. Love how you used cashews too! If ever brunch needed a reason to exist, this would be it! Great Blog I will definitely bookmark your blog. I am also having a blog related to food and drinks http://foodmarketnews.blogspot.com/ which gives latest analysis and trends in food and drinks industry in the present recession period. I would appreciate if you could kindly bookmark my blog too. hillary-Sure, that would work fine. cynthia-I'm pretty sure I'm buying Kent mangoes which are mostly green with a red blush on the skin. The flesh is a bright golden orange and is very sweet. foodlibrarian-Awww, that's awfully sweet. Thanks! arfi-I'm sure the mangoes are amazing there. Enjoy! marie-What's not to love about cashews, right? shobha-Thank you. I'm so glad you like my blog. And I'll be checking yours out too. Mangos are on sale at my grocery store and I'm very fond of them. This might be the perfect time to try this delicious sounding bread. I have never cooked with mango - but that is one mighty tempting photo! You always come up with these healthy, beautiful recipes. Love how high your bread peaked. Definitely sounds like a nice alternative, even replacement, for banana bread. Manog bread?? OH MY!!! You had me at hello. This looks phenomenally good, especially all the fruity, nutty bits in the batter. Must find mango! This looks so yummy. I like mango bread. Let me make.